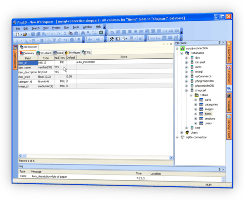 PHP Database Tools are essential for programming PHP connections with Database like MySQL, Oracle, Sqlite or any othersNuSphere's PHP IDE provides Database Tools for both generating the PHP code connecting to the database as well the Database connection client. How to connect from PHP to MySQL database? How to build PHP Form to insert or update MySQL records? PhpED's DB-Form Wizard for MySQL will help you to easily build PHP MySQL application with just a few mouse clicks. PHP Database tools supplied by NuSphere let you generate PHP Forms utilizing Ajax calls to the server side PHP scripts. Learn more about generating Web 2.0 ready code in PhpED here. PhpED DB Conenction client removes the need to ever leave PHP IDE to browse MySQL or any other Databases and tables supported in PhpED. Built in PhpED's tab, DB Connection Client for MySQL makes building PHP MySQL application a pleasure.